Tomoko Juroki naturally assumed she'd be popular when she got to high school...but then cold, hard reality swooped in for the attack! Turns out all the popularity points she'd racked up in her video game dating sims are worth squat in real life, and Tomoko's far from prepared to navigate high school! How can she possibly hope to impress her classmates when she can't even talk to them?! A new high-school heroine is born (maybe?)! No Matter How I Look at It, It’s You Guys’ Fault I’m Not Popular! (Vol.1) was created by Nico Tanigawa and published in English by Yen Press. There is also an anime adaptation airing on Crunchyroll. Imagine a quiet teenage girl and think of every possible awkward situation she could get into. The result is the everyday life of fifteen-year-old Tomoko Kuroki. She has just started high school but she isn’t as popular as she thought she would be after training herself through various otome games. In fact, we soon find her eating lunch alone and realising she hasn’t spoken to anyone at school in the two months she’s been there. Tomoko’s insecurities have got to a point where she is starting to berate other girls in her head for being what she isn’t. She’ll complain about their short skirts, or the way they talk to boys. But then she’ll devise a strategy to gain popularity that involves trying to replicate their actions by, for example, changing her look. These attempts at emulating others often have cringe worthy results that makes your heart twist up in your chest. Tomoko gets into a fair few cringe worthy situations, including wiping her face with underwear in front of her fellow classmates. Pretty much everything that can go wrong with her plans to be popular does go wrong. It’s this element of inevitable failure that made me feel empathetic towards her throughout this first volume. She’s the girl who loves to play videogames, has manga and anime references up her sleeve, and daydreams. She’s not a bad person or completely blind to the norms of socialising, so why is she so prone to failure? The interesting thing about Tomoko is that she is a victim of herself and her own insecurities more than anything else. Her flaws don’t make her character stagnant, however, because she does want to blossom. But she’s going to have to find a way to do so on her own terms and without the burden of her preconceived expectations regarding high school life. Tomoko does sit on her own at lunch and doesn’t have any close friends apart from Yuu, who goes to a different school, but nobody really bullies her when she is being herself. Tanigawa never brings our attention to any characters that personally dislikes Tomoko apart from perhaps her frustrated younger brother, Tomoki, but he doesn’t hate her. For example, despite his protestations Tomoki does sit and listen to Tomoko when she demands that they have an hour long conversation every day so she can retrain herself in the art of talking to people. The lack of external bullying aimed at Tomoko helps highlight how, despite the title’s Tomoko-ish claim that ‘it’s you guys’ fault I’m not popular’, it’s often Tomoko’s internalised issues that hold her back from being ‘popular’ in the way she dreams of being. The beauty of this manga is that, for all the situational comedy, the creator does treat her awkward teenage heroine with compassion. There are gentle moments of human kindness directed at Tomoko that she never sees. Such as the time she gets stuck under a shelter while it rains, with two boys she doesn’t know. She tries to make jokes that they don’t hear, she tries to be cool but they don’t notice. So she hides in the bathroom but is scared to stay too long in case they think she’s taking a dump. By the time she goes back they are gone and she is just left feeling like she’s failed to act correctly in a social situation. She falls asleep on a bench in the shelter, alone. While she sleeps the boys return and leave an umbrella beside her so she can get home in the rain. She wakes up and finds the umbrella but never realises that the two boys were the ones who bought it for her. Tomoko is often so self-conscious of her behaviour and how she thinks it is perceived by others that she can’t see that not everyone is as judgmental as she is of herself. 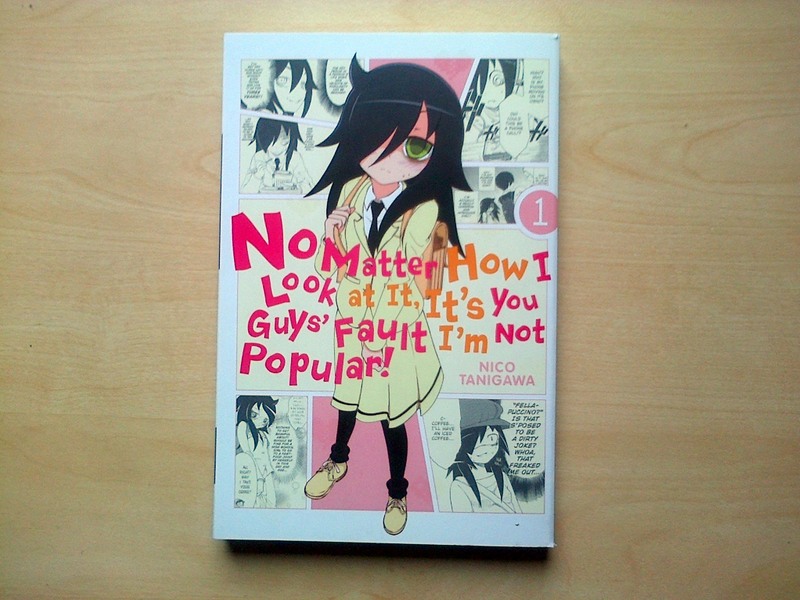 This volume is made up of nine short episodes in Tomoko’s life, each one filled with her insecurities, awkwardness, failures, and small victories. I want to believe she will gradually be able to open up to other people, but it will be a slow process. As I read this volume I laughed, cringed and nodded along occasionally to the parts of Tomoko’s character I recognised in myself. I recommend this manga and look forward to reading volume 2.